The Canadian Spa Company is not particularly well known in the UK, but they are a global producer of award winning spas. The Rio Grande, their smaller 4 person offering to the market, is the tub that I have been spending the last week reviewing, and they have certainly lived up to their 2015 ‘Best of Class’ award. The Rio Grande is not the biggest or the flashiest tub that I have reviewed, but certainly it offers some great benefits that I will outline fully below. The first important thing to note with the Rio Grande, is the fact that it has an impressive water depth of 29 inches. 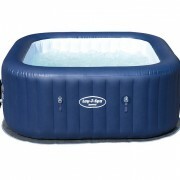 If you are not familiar with inflatable hot tubs, this specification may not mean anything to you. As often happens with a standard inflatable tub, trust me when I say that there is nothing more disappointing than sitting down, settling in and realising that you will not be able to warm your neck and shoulders. The extra depth provided by the Rio Grande is especially important to people like me, who are above average height. With the Rio Grande, all of you giants out there can be assured that you are going to enjoy all the benefits of the tub that your midget friends have been bleating about. 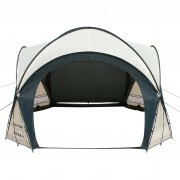 There is nothing particularly impressive about the width of the Rio Grande, and it is designed for up to four people. Now this is where the Rio has a bit of an issue. I would be inclined to say that it is perhaps better suited to two adults, and two young children. The problem with this is that with the added depth, young children are not going to be able to sit down and enjoy the tub with their head safely above water. Consequently, I would recommend the Rio to couples or to those parents with children over 10 years old, as I suspect it would not be suitable for a young family to enjoy safely. The maximum temperature of the Rio Grande is 39 degrees, which in my opinion is plenty, but you heat freaks out there may be disappointed. The really great thing though is that the Rio manages to keep this temperature very well, with the reinforced inflatable liner, and the thick inflatable lid. There are no instructions from the provider about whether the Rio has to be packed away in colder temperatures. The fact that this is a Canadian company would imply that it can cope with all of the extremes they are used to over there (noting the freezing conditions of the Rockies), but as there is no specific information, I cannot sell this as a plus point until further instructions are provided. If you are the gambling type I ask that you please keep an eye on it and don’t, whatever you do, let it freeze over. Keep it at a low temperature consistently so as to avoid any nasty surprises when you want to jump back in. 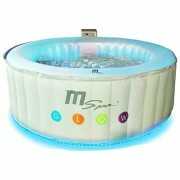 As with most other tubs on the market, when the bubbles are on, the tub cools down significantly. The bubbles draw air from the outside of the tub, so depending on the outside conditions, be wary that you may have to kick start the heating process quite frequently. The Rio does have a very efficient heater, so you can get to 39 degrees a bit quicker than you would with other models, and with this feature it is much more ‘plug and play’ than one could consider some of it’s competitors. Now, with the Rio, the setup does need some getting used to. As I have set up SO MANY of these tubs, it is really important for me to approach each one as if I am a total novice. The instructions do leave a bit to be desired, and although they say that it only takes 15 minutes for two people to get it going, my experience was a little different. One insider tip I would give is that Youtube is a Godsend in these circumstances. The Canadian Spa Company has very kindly uploaded a set-up video for the Rio Grande that is a great backup for when the instructions seem like they are written in Greek. 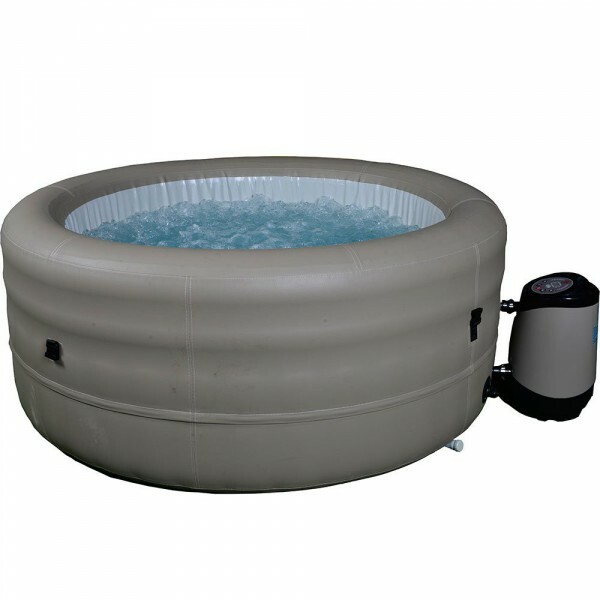 It is a portable spa, and I will say that once you have set the Rio up a few times, you will be able to transport it easily to any party or country-house-get-away that you want to. Practice with the Rio, does indeed make perfect. There is nothing particularly standout about the Rio with regards its build quality, but there is also nothing that raises alarm bells. 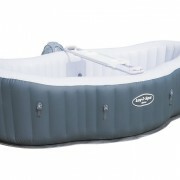 The Rio Grande is as structurally sound as most of the other tubs on the market. 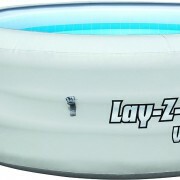 It uses I-Beam technology, which is the same as the renowned Lay-Z-Spa range, so you know that you are buying a product of quality. The extra liner on the inside is a good feature, in that it keeps the heat in more efficiently than with other models and the control panel is separate to the Spa, which helps you keep a close eye on what your Rio is up to when you are not emerged in the water. The Rio has gone one step further than it’s competitors with regards it’s safety features which will reassure all of those parents out there. 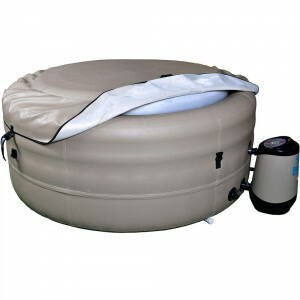 Obviously, the spa comes with the standard inflatable lid, to stop little people being tempted to get in without supervision, but the Rio also has a clever technical lock on the control panel which stops little hands wreaking havoc with the temperature and increasing your electricity bill. As I say with all of my reviews, please keep an eye on your kids whenever they are anywhere near the tub, as these safety features are not fool safe and we all know how crafty children can be. The Rio isn’t the most innovative of products, but there are certain features that make it stick out from the crowd in a very good way. The extra depth, and the renown of the company (being heralded as great with customer service, and a great provider of spa products) make the Rio Grande a sound choice for UK consumers. It is not the largest, it doesn’t have the most bubble jets and the set-up is a bit of a struggle to get your head around, but the extra depth makes all of this seem a small price to pay for the added relaxation.